This is our most common on-site repair. This repair is exactly what is described above and more. Adrian will clean your camera inside and out, lubricate any part that needs it, adjust metering, focus and the exposure system, if required. He'll look at film transports in film camera and card readers in digital cameras etc. Also if your camera has foam seals or a mirror pad, he will repair or recondition it if needed. This is a general overhaul that is highly comprehensive and will bring your camera as close to factory spec's as possible. Because more and more people are shooting with Digital SLR cameras, digital sensor cleaning is a repair service Adrian is performing more frequently. Dust will accumulate on a digital camera's low pass filter and sensor during normal use. This is an unavoidable cost of photographing with this type of camera. Our highly professional cleaning service will eliminate the greatest amount of dust while not affecting the overall condition of the sensor. Adrian tests and re-tests thte camera's sensor thoughout the process to maintain optimum results. Don't trust your expensive camera with cheap alternatives. 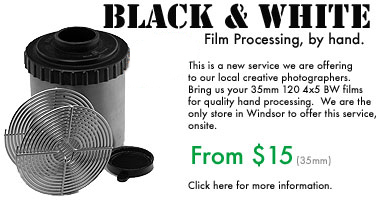 We will hand process 35mm 120 format and 4x5 sheet films onsite by hand and provide either processing only or a digital contact sheet with your developing. Processing is done every friday for Monday pick up. Rush service is dependant on Darkroom usage and availability. All film is returned to you sleeved and ready to use. * 4x5 film is processed with a minimum of three sheets. All extra sheets pay single sheet price.